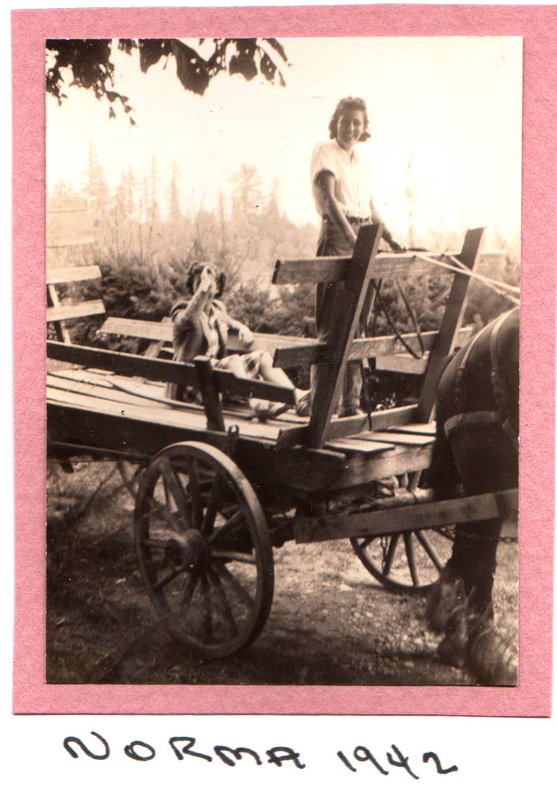 We had about ten acres in oats… the threshing outfit was to come, and neighbours would come and help. The day the man that owned the thresher called to say he was coming that day, Dad had gone to New Westminster… so it was up to me. I went and rounded up a crew, and when the threshing machine was all set up, it was me that was positioned on the stack. I forked all of the bundles into the machine, and the men looked after the rest of it. When dad got home it was all finished and cleaned up. I was pretty tired, but proud of myself for handling the situation as well as I did. I was 17! Bill Rowse drove the 4X bakery truck that delivered bread to us on Tuesdays, Thursdays and Saturdays. Yes, they delivered bread to your door, and still did in the 50’s when my kids were little. He always had coffee and cake at our place. Sometimes we would do a little target shooting with the 22 rifle… like plugging a nickel at thirty feet!.. or lighting a match! Bill was never too happy about it as I usually beat him at shooting! Before Christmas they held a turkey shoot at Otter. No, you didn’t shoot the turkey… you shot at a paper target, and the best shot won the turkey. Dad and I went …I was the only female shooting, and the youngest person competing. There were ten men shooting against me… all of them laid out flat on the ground to steady their aim to shoot. I stood… and they laughed and sneered at me…but I had the last laugh… I won the turkey! Dad shot with another group and he won a live goose. Not a bad haul for the two of us!We had a bit of trouble with the goose, and had to lock it up in the woodshed for a couple of days. I spent a week of the summer holidays with Mary Rowse at White Rock. 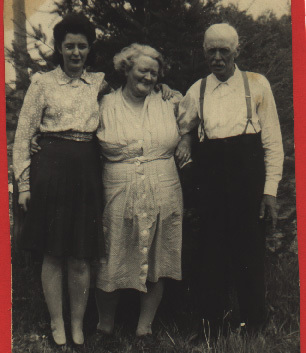 She and the three kids, Jack, Arthur and Joyce, had a cabin, and Bill came down on weekends. Another summer Ethel Trefry and Isabelle Taylor were staying at our place. Harry and Mary Hipwell, mom’s cousins, came down from Chilliwack to take me back to spend a week at their cabin at Cultus Lake with Rosemary, Bill and Jack. Rather than have me miss out they took Ethel and Isabelle as well. The cabin was right on the Lake so we could go swimming right out the front door. There was a roller skating rink there as well, and we really enjoyed ourselves. 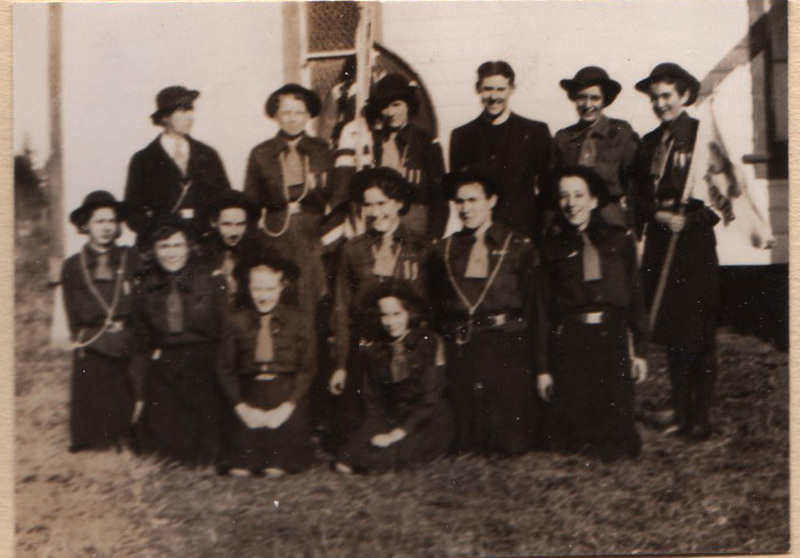 Our next door neighbour, Mrs. Bernstein, organized a Girl Guide Troop. I can remember Joan Flowerdew and I cooking dinner for twelve people at Flowerdew’s in order to get our cooking badges. I also got badges for homemaker, sewing, artist, farmer and horsemanship. We had to pass tests for each category and it was a real challenge working to get each badge. I remember making Christmas cards and selling them for $1.25 a dozen! I sold eight dozen (96 cards). They were all hand drawn and painted with watercolour. Good Morning NONI. Home delivery of bread. I remember that, I also remember Nelson’s Dry Cleaning coming and picking up his shirts for laundering. The TV repairman, the Avon Lady and the Watkins man all paid regular visits. OH yes the doctor came too. Morning, Dave! So good to see that you are visiting, and commenting… Kettle’s boiling, so we can have a cup of tea… cream? sugar? What a difference in life styles over the past decades! I never remember mom and dad going “out to eat”. When my kids were little we went to Chinatown about once a month and had a two dollar family dinner and got to take some home! Home back then smelled of home baked goodies. When the batch of bread came out of the oven, we devoured one loaf while it was still hot! Do you remember doing that? Thanks for your visit, Dave. Have a great day. Wow, you really did it all! I love the story about target shooting and the turkey shoot – they didn’t know who they were up against! 😉 What a lot of work went into those Christmas cards for such little money. My mom was a public health nurse and worked Monday to Friday, so Saturday was baking day. The wonderful smells of fresh bread, cinnamon rolls, cookies and occasionally even cream puffs! We used to have the milk man, Page the dry cleaner (in a Page uniform), the vegetable man (in a truck with a scale hanging from the back) and also house calls from the doctor. We didn’t get a family car until 1963 – a Rambler! Our family never went out for dinner or picked up dinner. My dad had a corner store, and our treat would be a chocolate bar on Saturday night – oh the decision of what one to have!! Hello Norman… It is so good to have you visit, and comment.. Let’s have that cup of tea while we talk. I’m sure you have lots of good memories, too, and I’m really glad that I am stirring some of them up.. .it is good to remember, and to be thankful for the good times that we had. Thanks for visiting, Norma… I do really appreciate it. Reading of all your activities makes it easier to understand why you’re so active even now! You were always so busy! I’m glad to hear there’s another woman in the family with a good eye for shooting. Dad taught me to shoot a .22 in my ‘teens, and I remember being paid .25 each to “take out” the gophers who popped up from the holes that were a hazard for the horses and cattle at the Pogues’ fields in the Cariboo. Good morning Carol! Thanks for coming by… join us for tea? CAn hardly wait until this afternoon when you really will join me for coffee! Good morning Heather. Just in time for a fresh pot of tea! Yes, those guys looked a little sheepish when they learned that I had beat them! Have a great day! What a life you’ve had. I really enjoyed this one! Thanks for coming by Ra, and for your comment…. Yes I have had quite a varied life, but I never did learn how to bunji jump, nor have those belly dancing lessons… guess it’s too late for that now that the Doctor says “no more dancing.” HAve a great day. Love… you know who!